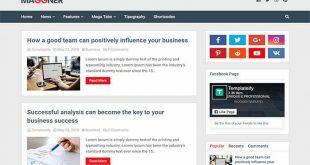 Flow Blogger Template is one of the most creative theme that’s ideal for Magazine blogs. 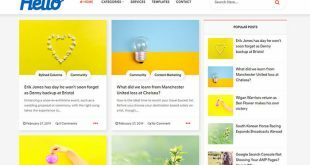 If you’re going to start one new Magazine or news blog on a blogger platform then this theme is one of the best choice for your new blog. 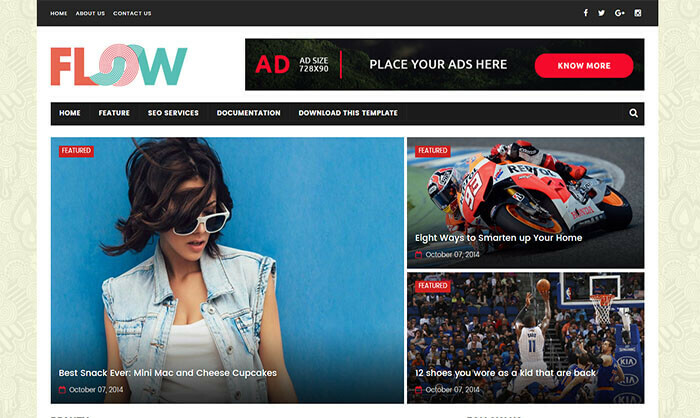 The flow blogger template comes with the responsive and user-friendly layout. It will not only make your website super faster but help you, loyal readers, to browse your website easily. The creativeness of flow blogger template design can be seen from its demo version. If you clearly take a look at its preview version then you will be able to know that the each portion of this template is different from another one. You can display your most important posts in specific places. So you readers can access them easily. It’s also ads ready templates, so you don’t need to worry about the monetization of your blogger blog. It has beautiful navigation bar as well as a section that you can use to display your trending posts on the homepage. You can assign specific tags to your desired posts for displaying them right below the nabigation bar. One another awesome feature of this theme is that it’s SEO friendly theme. That means half of its on page SEO is ready. All you need to do is to make some required changes in this template and you will be able to rank your website higher.